Back in November, when I was busy painting Jesse Tree Angels, Rascal asked if he could try painting some dolls action figures to give as a Christmas gift to his older brother. I was more than happy to share my supplies and was totally impressed with his creations! 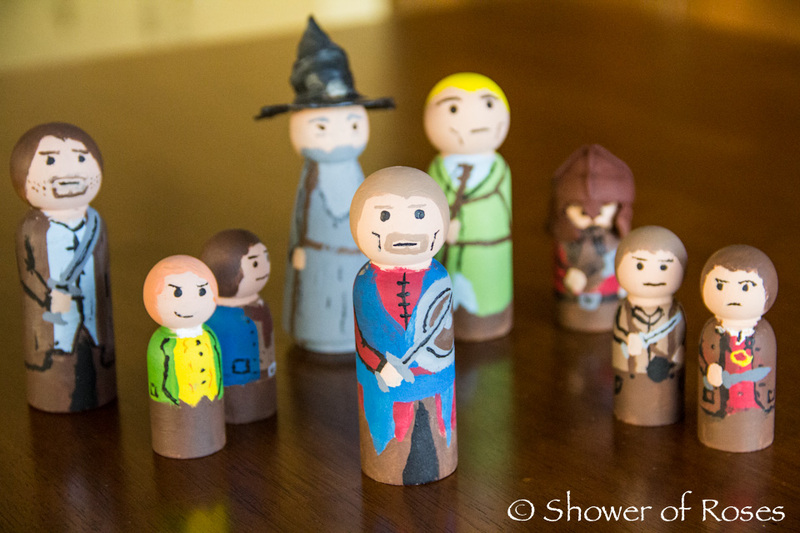 I ordered these Little Wooden People from CraftParts.com. You can also find a set of 40 assorted sizes on Amazon. He is hoping to add to the collection this year and I'm looking forward to see what he paints next! Speaking of Rascal... His birthday is coming up at the beginning of February. It always sneaks up on me and I just realized I need to hurry if I plan on ordering any gifts for him online and wondered if any of you have any ideas? He loves The Hobbit, Lord of the Rings, and Ranger's Apprentice (he just finished reading Book 12 which he received on Christmas). We have the paperback version of The Hobbit, so I've been considering possibly ordering him The Hobbit: Illustrated Edition, to give him along with a copy of The Art of the Hobbit. I've also been considering a LOTR/Ranger Cloak from Etsy, and whether or not I should attempt to make this myself. . . I'm just not very good (at all! - or very patient) when it comes to sewing. I also love this shield and sword set, but it's way too expensive. And I sure wish just the Ent was available from LEGO, without having to buy The Tower of Orthanc (I need to check ebay). Perhaps he'd like a box of art supplies with some new little people to paint. . . Hmmmm. Anyways, if you happen to have a suggestion for a great gift for a soon-to-be 12 year old boy, who especially loves playing outdoors, creating with legos, and building models, I'd love to hear about it in the comment box below. Thanks! What a thoughtful brother! The LOTR figures look great. Thanks, Erin! I'm clicking over to check out your tutorial now! As for the bow and arrows, I know we have a set they play with often that belongs to him (I think he won it from a raffle), but my I don't know how good of quality it is and my oldest just said they need new arrows. Great suggestion, thanks! Tell Rascal his figures look great! He seems to be following well in his mother's creative, artistic footsteps! I think a wood burning tool is a wonderful gift for a boy of that age, particularly one already inclined to art and handwork like Rascal. Something about the wood and 'burning' and the lovely smoky smell that is very appealing to boys. :-) So many craft projects and handwork skills you see are geared towards the feminine; I think woodburning (or wood pyrography if you want a fancy name) lends itself quite naturally towards the masculine. He would LOVE that, Kimberlee! Thank you! I had considered a wood carving kit, but wasn't sure about that idea. Woodburning is perfect for him! My soon to be 15 year old (next week) piped in with a few ideas. If he likes model building, how about model rockets? That was always a favorite of Nick's for about 3 years, ages 11-14. He also suggested a hatchet for wood splitting, fort building or a sawg tomahawk, great for throwing at a large round of wood or giant sheet of very thick styrofoam. Nick also told me he always wanted a motorized scooter when he was that age. Thanks for all your gift giving posts. They are so helpful when planning our birthdays, easter baskets, stockings, etc. Most of the book ideas for Easter baskets this year are from your suggestions. 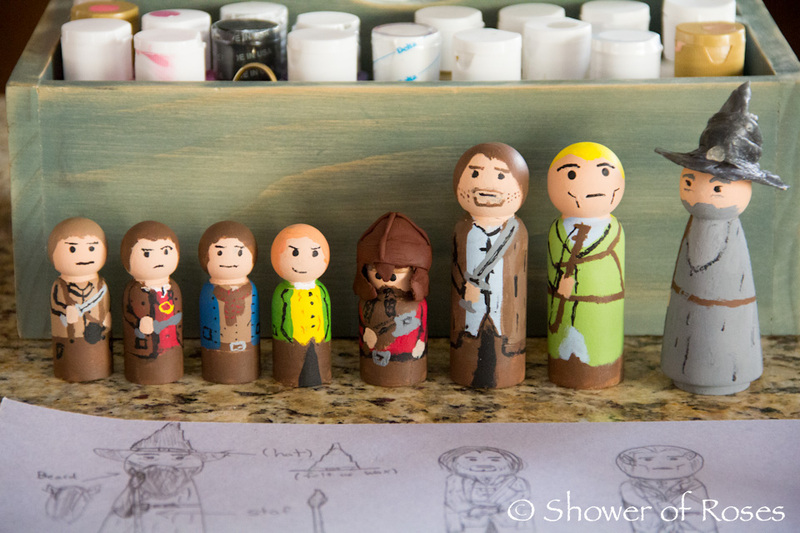 Great job on the LOTR figures, Rascal! My LOTR fans were very impressed. I second the woodburning tool idea. My soon to be 12 yr old son received one last year and he loves it. And I am definitely going to have to pickup a woodburning kit. Is there a particular kind/brand I should look for? You know, my oldest mentioned the LOTR ring, and I need to look into that. Right now they will pull out the ring from one of their games when they need it! :) Oh, and we don't have Keva planks. I'll have to keep those in mind! LOVE Rascal's action figures! I am planning on getting the "Hobbit: Illustrated Edition" as well for my daughter's Easter basket this year - as a read a-loud book for us. It had good reviews! Maybe Rascal should open up an Esty shop with his action figures! I wonder if there would be a market for it? I was just coming back to say that my oldest son received a woodburning kit for Christmas and it is getting a lot of use. I guess I third the woodburning idea. My second son was just 12 in September. Some of his birthday/Christmas favorites were: The Hobbit: An Unexpected Journey Visual Companion, The Hobbit: An Unexpected Journey Chronicles: Art & Design, Lego Hobbit/Lord of the Rings sets of course;-), Ticket to Ride board game, The Struggle for Catan card game, sketch books and nice drawing pencils and a Swiss Army knife with his name on it. When we were at Barnes & Noble on New Year's Eve the older boys went straight to those books and were flipping through them :) They have most of the Hobbit/LOTR Lego sets - not all though - they don't have The Hobbit Dol Guldur Battle or Goblin King Battle, or the LOTR Orc Forge or Orthanc... We've stayed away from most of the scarier scene sets but I do have the Battle at the Black Gate and Mines of Moria (found it 50% off!) stashed away to use as gifts. We got Ticket to Ride last year and we all have been having a blast playing! We got the original version of Ticket to Ride, but I'm curious about the others they have too - there are so many now! Thank you so much for sharing all your great ideas! The Battle at the Black Gate was a big hit here! We haven't played any of the other Ticket to Ride games but some friends have Ticket to Ride Europe and their children (both over 10) LOVE it. I also forgot that my boys (12 & 14) really enjoy their Lego books: LEGO Minifigure Year by Year: A Visual History, LEGO Play Book: Ideas to Bring Your Bricks to Life & The LEGO Ideas Book. Great job on the figures! He is very talented. Has he ever done any of the 3-D puzzles? I have seen some amazing ones like Notre Dame Cathedral. We haven't, but we have a few that we still need to put together! My husband has mentioned that once we complete the ones we have he'd love to get one of the cathedrals! My boys, ages 10 and 12, had a few favorite Christmas gifts. One was Brick Warrior add-on pieces. They are mostly weapons (unfortunately) but they add on to Lego mini figures. Hours of fun. The other thing they are totally completely immersed in right now is cubes. We probably all had a 3x3 Rubiks cube at one time. There are so many other (and better!) versions of this. They have a friend who taught them the tricks of solving the cubes and now they are hooked. My 12 year old is working on solving a cube in less than 45 seconds. It's pretty impressive, actually. And it doesn't stop with just the normal 3x3 cubes. There are many different types. Good luck! And thanks so much for what you do. You are my go-to for Catholic books, gifts, feast day celebrations, and much more. You have shown me how beautiful our faith can be and how I can make it alive and beautiful for my family. Well, you can't go wrong with LEGO Hobbit sets. Best of both! My son loves Legos and LOTR and Hobbit too. Eons ago you recommended Axis and Allies spring '42, and my son loved it. I don't know if this recommendation would be good for this kid, but check out the board game Viktory II if you haven't already. It's faster-paced, but has neat little ships, etc. that you move. Nice video by the guy who created the game as to how he made it. My boys (ages 14,12,10) received some fun presents for Christmas. I think a cloak is a great idea! Oh, and I love the peg dolls! He did a much better job than I would have! Very talented fella. I thin it was the original- whatever I linked to. I highly recommend it- they play often. Our game closet was stuffed too, but once we got rid of the games they never played we were able to fit a few more! What about the 3d lord of the rings jigsaw puzzles? Amazon has the hobbit on and a few others. My son is 12 and he has his eye on several of the Duct Tape Warfare books (http://warfarebyducttape.com/). He also got a game for Christmas that we like called Dominion, similar in style to the Catan games. 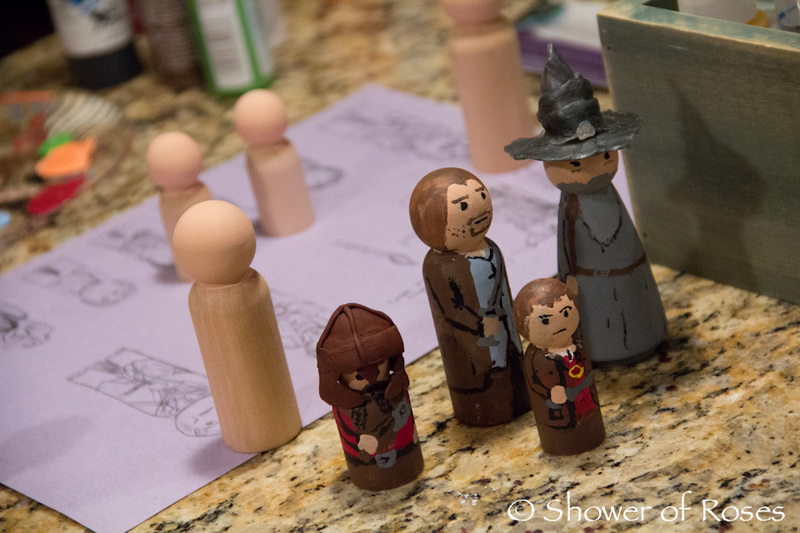 Love the LOTR figures - great job, Rascal! I think he should open his own Etsy shop, he did a fantastic job. I love all the ideas in the comments too, we are another boy household that loves all things Tolkien. Wow!!! Those are so neat! He did a great job. They look just like the real people! One building set that might be fun for someone his age would be a wooden trebuchet/catapult. My ds, who is 11, received a wood burning kit for his 10th birthday. I though he would love it, but it was one of those three day wonders. Once he tried it out and spent several hours burning wood, it was as though he came to the limit of his interest. In the past year he has pulled it out only once to use. I was disappointed because I thought he'd love it. In reality, I can see that he likes more open ended projects- sketching, building with Legos, painting. There is only so much you can burn onto wood. We also bought a Duct Tape Warfare book for him for Christmas. He loves to make things with duct tape. But again, that was a miss. I think it was because the book comes as a pdf file. He can't hold it and look at it, and he only has a basic Kindle reader, so the pictures are not in color. His favorite birthday/Christmas books were a new bike, handmade socks in camo yarn (from Grandma), the Backyard Ballistics book and several Jim Weiss audiobooks. He especially liked Masters of the Renaissance. Oddly, he also requested a calligraphy set and has enjoyed writing with the pens. He is not doing any calligraphy, but he gets a kick out of drawing with the different nibs. What about a mini microscope? My 12 yo bought one for my 10 yo for Christmas for about $5 on Amazon and the thing is a huge hit! My boys love all of the Sports Illustrated Kids books filled with stats and they have the SI Kids drawing book. We got Rummikub for Christmas and everyone loves playing that. 10 days in the USA is also great. Does your son have the book Dragon Slayers: The Essential Training Guide fore young Dragon Slayers? That's a big hit here too. Your son did a splendid job. His artwork always speaks to me! I think anything that would encourage his artistic expression would be a delightful way to nurture and support His talent. I absolutely think he has a sacred gift like his mama. I love seeing the exciting ways you celebrate life and bring joy to children. God bless. you!!! Happy birthday Rascal!!! How awesome! He did an amazing job! He needs his own Etsy shop now! Okay, so I have to ask... your children have seen the LOTR movies, right? How did they do with the violence and disturbing creatures? How do you prepare innocent hearts for such sights? I'm not a mom yet and won't be anytime soon, but I'm wondering how mothers such as yourself handle these things?! Thanks for your input! Thank you so much for so honestly answering my question! I admire the spirit in which you are raising your children, and think your solution of how you are doing it with your sons to be very balanced and beneficial to the growing hearts and minds! Being able to preview and skip parts is SO helpful! Most impressive, however, is how you are communicating it to and with your sons, so that they understand they "why's" of your choices... and I'm sure, respect you all the more for it! I hope to be able to implement such parenting skills, should God bless me with a family some day. Thank you for sharing! What about archery lessons or a bow and arrow set? My nephews loved these - you can buy very inexpensive and safe models.